The Senate shall chose their other Officers, and also a President pro tempore, in the Absence of the Vice President, or when he shall exercise the Office of President of the United States. The Electors shall meet in their respective states and vote by ballot for President and Vice-President, one of whom, at least, shall not be an inhabitant of the same state with themselves; they shall name in their ballots the person voted for as President, and in distinct ballots the person voted for as Vice-President, and they shall make distinct lists of all persons voted for as President, and of all persons voted for as Vice-President, and of the number of votes for each, which lists they shall sign and certify, and transmit sealed to the seat of the government of the United States, directed to the President of the Senate;--The President of the Senate shall, in the presence of the Senate and House of Representatives, open all the certificates and the votes shall then be counted;-the person having the greatest number of votes for President, shall be the President, if such number be a majority of the whole number of Electors appointed; and if no person have such majority, then from the persons having the highest numbers not exceeding three on the list of those voted for as President, the House of Representatives shall choose immediately, by ballot, the President. But in choosing the President, the votes shall be taken by states, the representation from each state having one vote; a quorum for this purpose shall consist of a member or members from two-thirds of the states, and a majority of all the states shall be necessary to a choice. And if the House of Representatives shall not choose a President whenever the right of choice shall devolve upon them, before the fourth day of March next following, then the Vice-President shall act as President, as in the case of the death or other constitutional disability of the President.--The person having the greatest number of votes as Vice-President, shall be the Vice-President, if such number be a majority of the whole number of Electors appointed, and if no person have a majority, then from the two highest numbers on the list, the Senate shall choose the Vice-President; a quorum for the purpose shall consist of two-thirds of the whole number of Senators, and a majority of the whole number shall be necessary to a choice. But no person constitutionally ineligible to the office of President shall be eligible to that of Vice-President of the United States. Section 1. 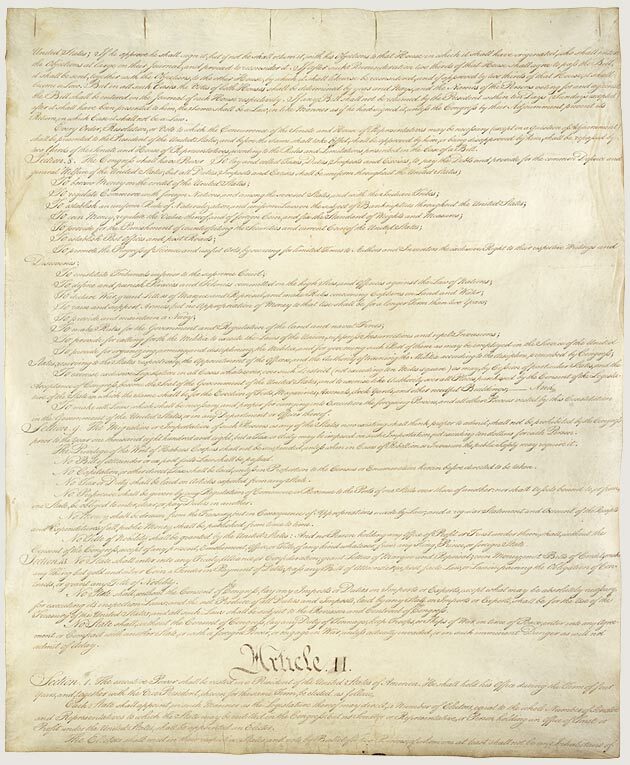 No person shall be elected to the office of the President more that twice, and no person who has held the office of President, or acted as President, for more than two years of a term to which some other person was elected President shall be elected to the office of the President more than once. 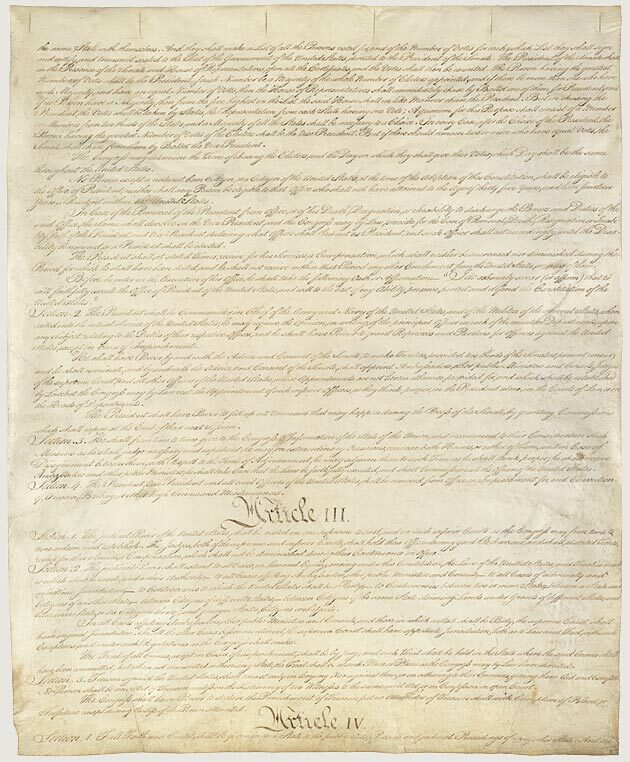 But this Article shall not apply to any person holding the office of President when this Article was proposed by the Congress, and shall not prevent any person who may be holding the office of President, or acting as President, during the term within which this Article becomes operative from holding the office of President or acting as President during the remainder of such term. Section 1. 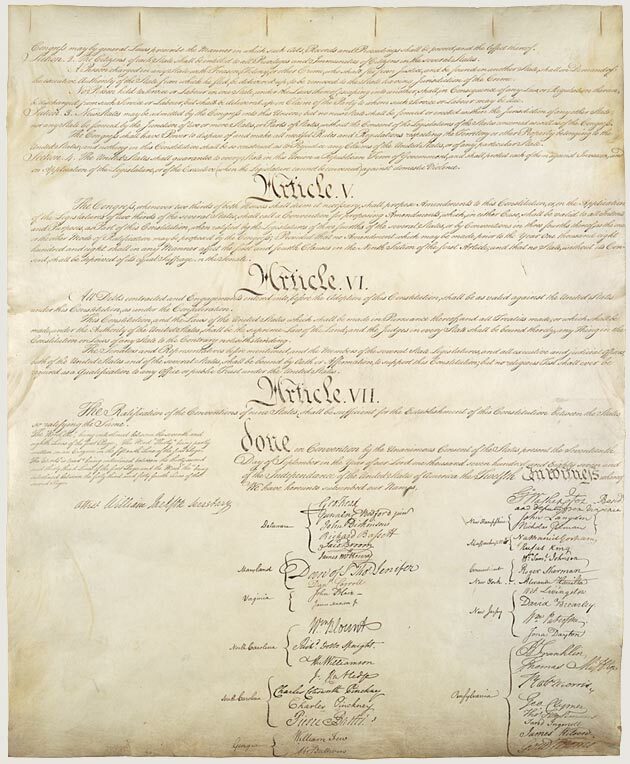 The right of citizens of the United States, who are 18 years of age or older, to vote shall not be denied or abridged by the United States or any State on account of age. All of the above document has not been edited in any way by anyone here. 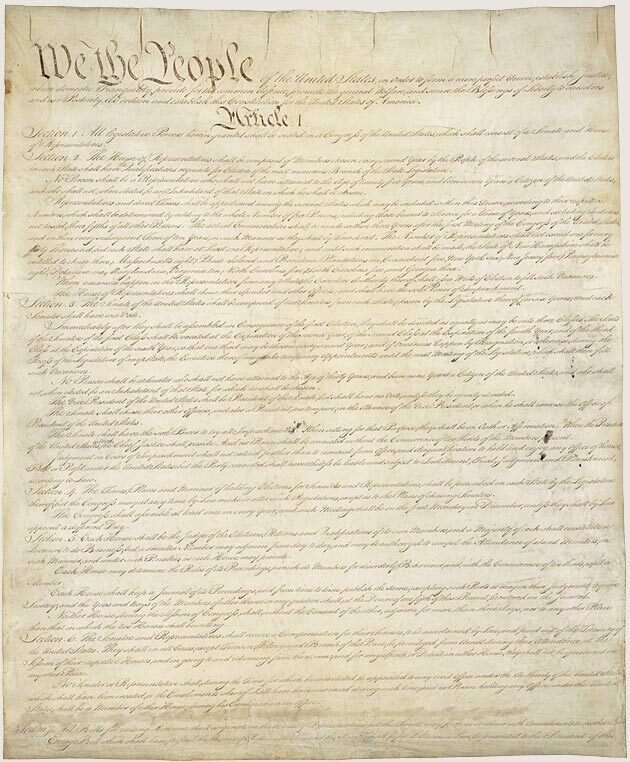 This is the US Constitution and the Bill of Rights as written. 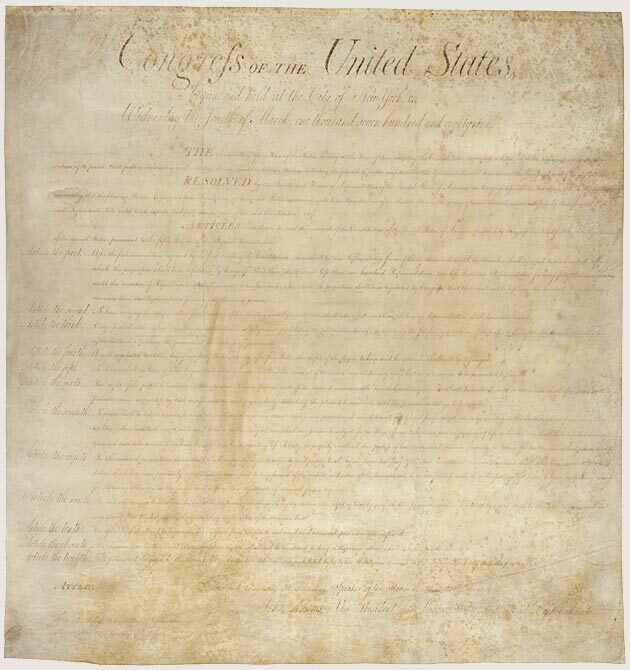 The Federal Convention convened in the State House (Independence Hall) in Philadelphia on May 14, 1787, to revise the Articles of Confederation. Because the delegations from only two states were at first present, the members adjourned from day to day until a quorum of seven states was obtained on May 25. Through discussion and debate it became clear by mid-June that, rather than amend the existing Articles, the Convention would draft an entirely new frame of government. All through the summer, in closed sessions, the delegates debated, and redrafted the articles of the new Constitution. Among the chief points at issue were how much power to allow the central government, how many representatives in Congress to allow each state, and how these representatives should be elected--directly by the people or by the state legislators. The work of many great minds, the Constitution stands as a model of cooperative statesmanship and the art of compromise. A teacher of mine called the Constitution the Operator's Manual for the government. She said it explains to those running the government what the law says they can and cannot do. She also called the Bill of Rights a warning to the government -- that these rights shall not be infringed upon. She was a teacher in a time when teachers taught their students about the greatness of the American government.